For the letter E, there was never a need to think of anything else. Amma had made this dish once and I decided this is what I was going to do for E. Of course I had to resort using the english name for this. Amma called it Kathrikai chops, going by the famous mutton chops. I am told that this dish has the same crazy as the mutton chops would have. I am not sure how much this is true as I have never lived in Andhra, however Andhrites are known for their affinity to Brinjal/ Eggplant. In fact there is a song dedicated to the goodness and yumminess of brinjals. My daddy is very fond of brinjal and can have it any form. So I knew he must have loved this dish as well. The first time I tasted this, I felt I had to use this for the ABC series. There was no question of using this for any other letter. Infact this vegetable can fit into so many letters, that it’s amazing. One Vegetable and I could have used it for so many letters as it is also called as Aubergine, Brinjal, Eggplant, Garden egg, Melongene, Kathirikai, Vankaya and if there are more I am not aware! End of the day I was happy I selected as this was such a delicious dish and as the bard says, What’s in a name! Grind all the ingredients listed under the paste, to a smooth paste using water. Wash and slit the eggplants through the middle into 4 parts, keeping one end intact. Stuff the masala into the eggplants. Keep it aside. Heat a non stick pan with oil, saute the onions till brown, then add tomatoes, once the tomatoes turn soft, add the stuffed eggplant along with the masala. Simmer and cook for 5 mins. Then add water and continue cooking till the masala is well cooked and eggplant turn soft. This takes about 10 mins or so. innoru pudu dish…have so may to try…looks delicious valli!! When i saw the name i thought it might be a deep fried ones, dunno for me chops means deepfrying..lolz, wonderful looking eggplant chops Valli. looks sooo delicious n yummy. That is a wonderful way to make eggplants..normally we used to stuff the small size brinjals..but this surely is interesting.will pass the recipe to my daughters as they love them..we don't get them in the house, me being allergic to them. OMG Valli.. that is such a tempting eggplant dish. You know my love for all things eggplant 🙂 I'm going to try this real soon. Long time reader, first time poster……you might want to change the first "garlic" in the paste ingredients to ginger. Also…i LOVE this blog!!!!!!! I too love eggplant in every form. Baigan in Hindi, Vaangi in Marathi and Ringna in Gujarati are three more words I can tell you for this very versatile vegetable. We too make similar stuffed eggplants but this masala is so very different that I must try it. Never heard about Eggplant chops but sounds delicious . Am a big fan of Baingan and will try this one for sure..
Mutton chops madhiri eggplant chops huh nice name loving the paste ingredients have lot of brinjal at home here comes my dinner recipe thanks for sharing valli ji. You are right :), so many name choices for this vegetable :)…Chops look great and I might try it sometime, it looks really good! I am sure the eggplant lovers will appreciate it! always " Yes " for eggplant.. 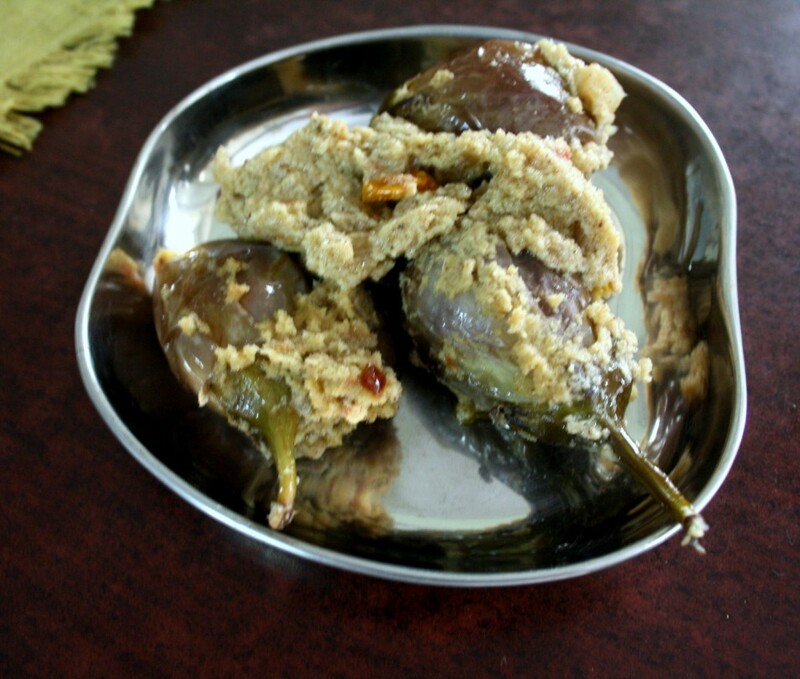 Delicious dish Valli..
A song dedicated to brinjal!wow!! I love brinjal and the name sounds different and I am sure to try this after this BM. I love eggplants and your dish is so new…With the abundance of it in my backyard, I should give it a try! This is new to me. Bookmarking it. These eggplants are sure versatile. Love them a lot much to the kids irritation. The stuffing part sounds so yummy. 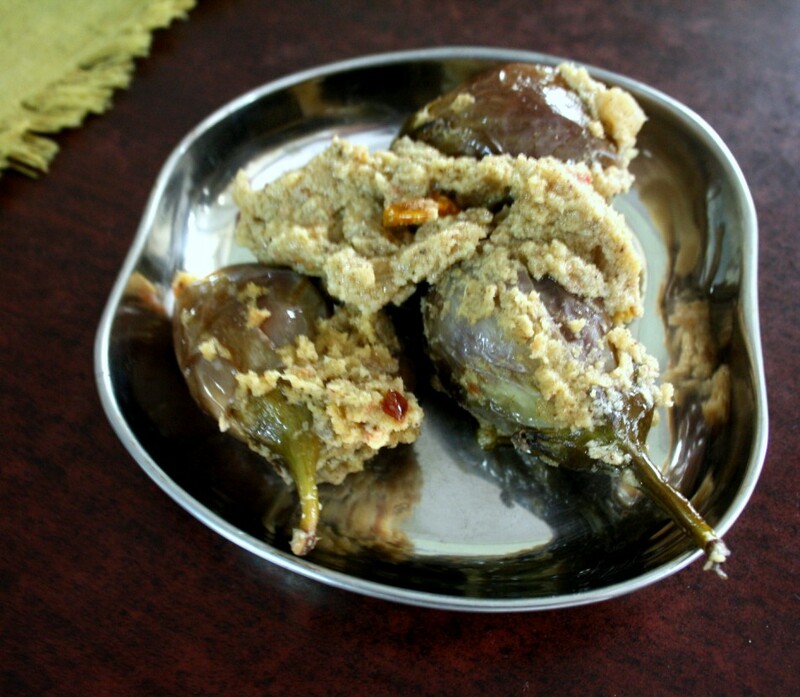 I have an aversion to brinjal, so will try using the filling with 'kovakkai'. And i can understand the dilemma of what letter to use it for! I love that masala filling. This is sure to go into my to do list. Interesting stuffing and it would have tasted awesome with simple dal rice..